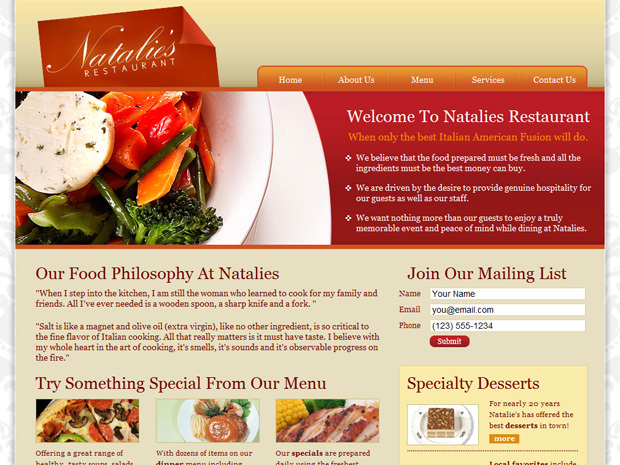 For Natalie's Restaurant, the goal of their website was to represent their tasty-looking dishes and prompt customers to stop in for a great meal. The bold design stands up well next to the strong Italian dishes that are featured throughout the website. Natalie's also wanted a custom gift certificate purchasing component that was custom designed and coded to meet their needs. This site is also a great demonstration of how our simple content management system can be used to organize content and make it easy for a client to update their information.